"Thalia and the Fates keep challenging each other as the drama, comedy, and tragedy of the Greek Pantheon continues." Thalia has a new test: she must use her influence over the Fates to bring about a happy ending for the goddess Athena and her beloved Artemis. But the Fates have decreed that Athena, the Goddess of Wisdom, will never be compromised by Love. When a huntress accuses Artemis of impregnating her, Thalia fears this turn of events is the Fates’ judgment. Meanwhile, Thalia has her own problems as the young demigod Adonis captures the affections of both Aphrodite and Apollo. Thalia's Musings - Snarled Threads has not been reviewed yet. 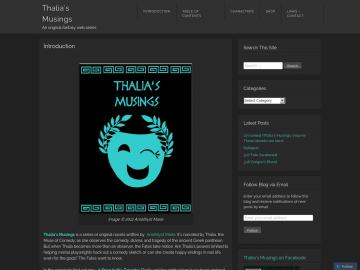 Thalia's Musings - Snarled Threads has not been recommended yet.